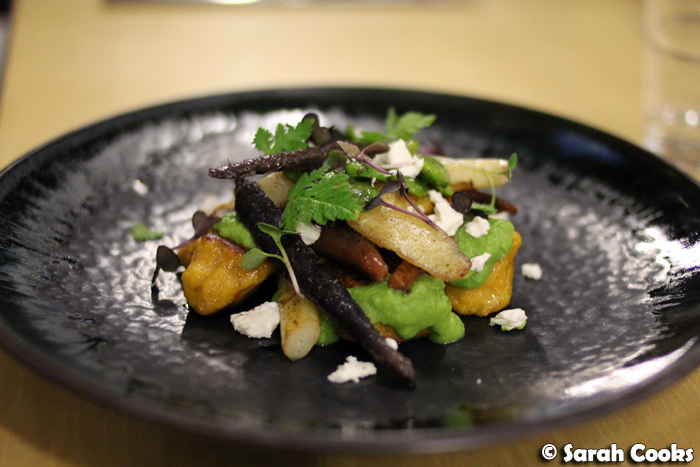 In December last year, I was invited to a bloggers' dinner at Captain Melville, a new pub-and-eating house with a mission to provide accessible yet well-crafted pub food. 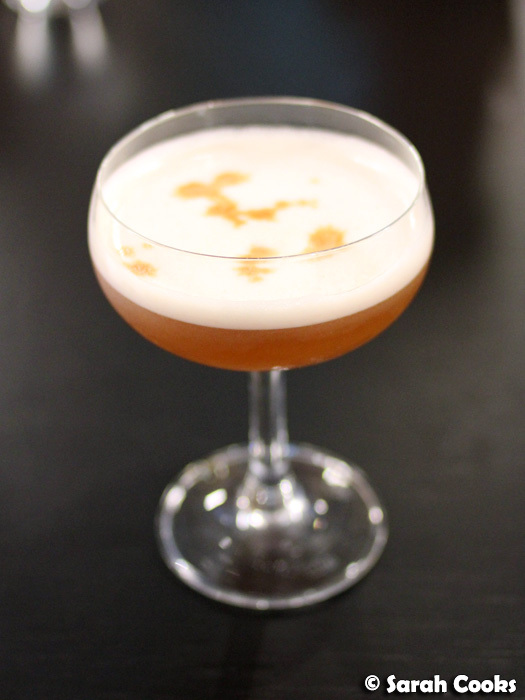 It was a fun evening full of cocktails, wine, and an eclectic range of tasty eats! 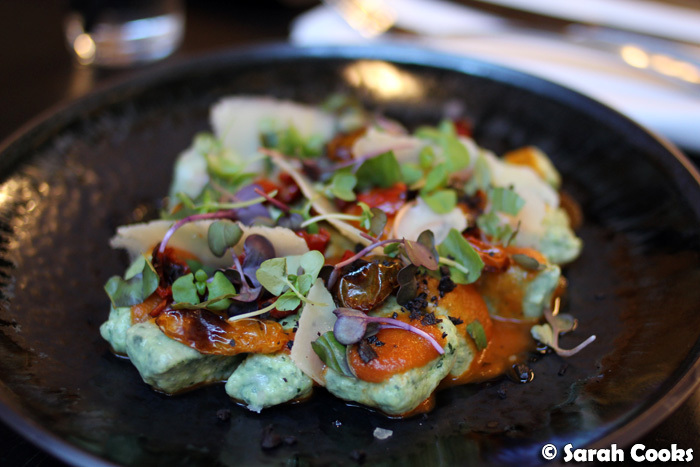 I enjoyed it so much that I visited again in March for a casual dinner catch-up with some friends - this post will cover both visits. First: the bloggers' dinner. 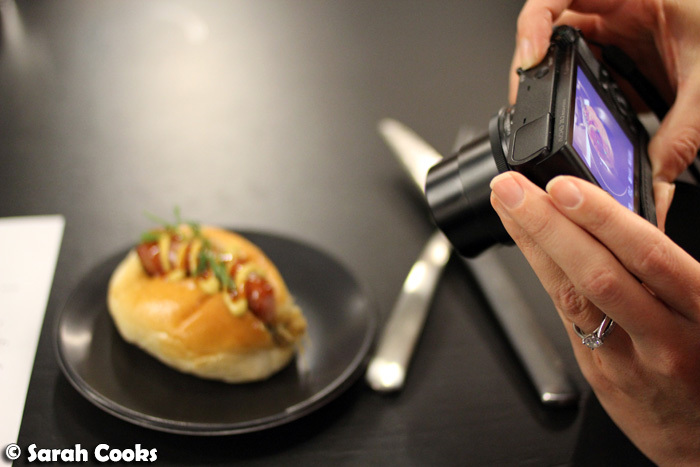 Cameras and smartphones at the ready! Macedon Gang Punch - "Hard as coffin nails"
Captain Melville claimed leadership of the Mount Macedon Gang-they waylaid travellers in the blackforest whilst living in gentlemanly caves throughout 1852. "Rum & port were drunk until the floor came up". Whilst I loved the sharply sour Macedon Gang Punch, with its foamy egg white topping, I wasn't quite as enamoured of the Sudden Death (not pictured): a curdled milk and rum drink, served in a shot glass. It was a bit adventurous for me. Agnes, however, loved them, so I happily gave her mine! We were also given a range of snacky little items (called "singles" on the menu). 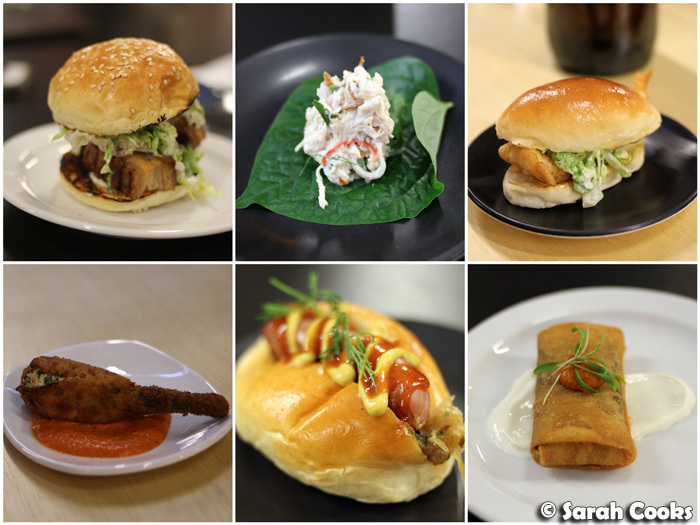 Highlights for me were the refreshing poached chicken on betel leaf, and the crackly pork belly slider. I loved the fluffy soft white buns (like: Bread Top buns! ), which were just lightly toasted, and the combo of tender pork meat and crackling. 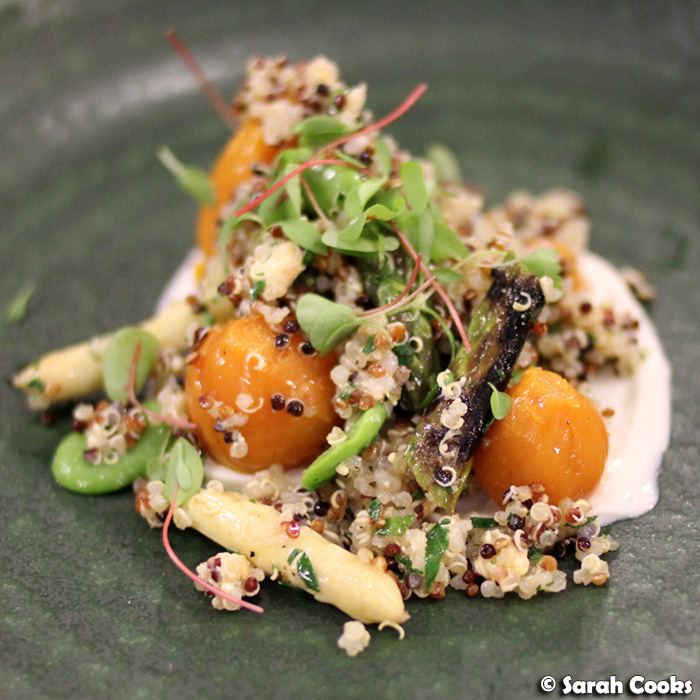 Even though quinoa salad is something I make reasonably often at home, I felt that the addition of shanklish, white asparagus, baby beets, and the fiendishly difficult-to-prepare broad beans turned this into something special. This was delicious, and I'd happily pay sixteen dollars for a full-sized plate of that salad! (The plate above was, I believe, made slightly smaller than the usual serve as part of the tasting menu). I didn't try the gnocchi (it was made specially for a lovely pescetarian on our table), but thought it looked very pretty - check out the crunchy edges on the little golden gnocchi pieces. 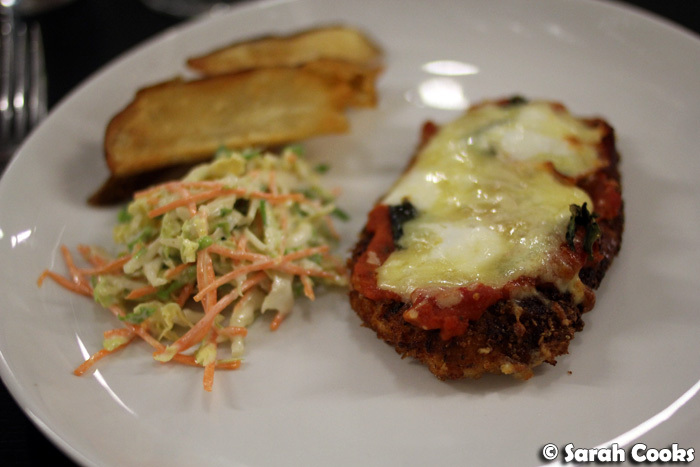 I was quite full by this stage, so was very thankful that the chicken parma also came out in a mini-version. (We saw some full-sized ones being delivered to neighbouring tables, and they were huge!) The chicken itself was great: lovely and crisp on the outside and juicy on the inside, topped with a slick of rich tomato sauce and cheese, but I wasn't too impressed by the hand-cut chips - I found that these wedge-shaped chips were slightly overcooked and dry. Dessert was immensely popular on our table - I thought of it as a banana split on steroids! 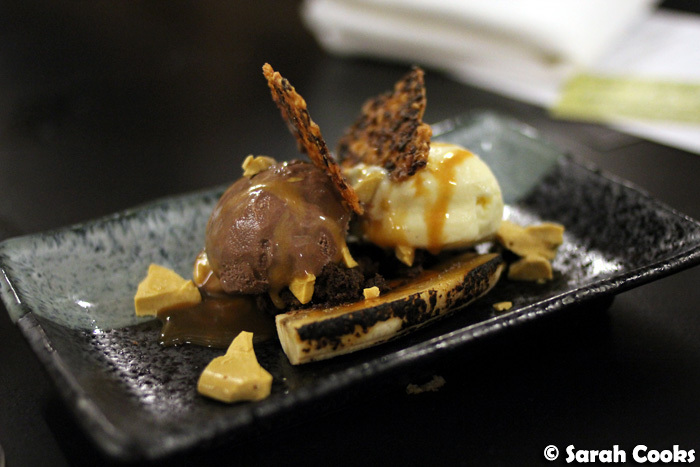 There was a blackened banana, honeycomb shards, cake crumbs, and chocolate and vanilla ice-creams, drizzled with salted caramel sauce and garnished with crisp sesame wafers. Yes, I was rather full, but bravely soldiered on through - it was that delicious! You can read more impressions of the night at Agnes, Sofia, and Cara's blogs. It was early March when I revisited (my, how time flies!) for a Monday-night catch-up. I'd really enjoyed the food and atmosphere at the bloggers' dinner, and thought that the wide-ranging menu would mean that we'd all be able to find something to enjoy. At the bloggers' night they'd made quite a big deal of the fact that Captain Melville was a Macedon Bushranger, but I must admit it kinda went over my head (I'm pretty useless with geography!) However, it all fell into place when I was perusing the cocktail list with my friend Wes who happens to live in that area - they have cocktails like the Macedon Gang Punch, Beechworth Gunpowder and the Clunes Rose Gold, just to name a few. "Omigod! These places are all near where you live! They're real!" Hahaha. I'd have loved to try some more cocktails, but it was a Monday night, so I contented myself with a nice cider. I was tossing up between a single meal or trying a few singles, and in the end the singles won. I wasn't famished, and variety is always a bonus! 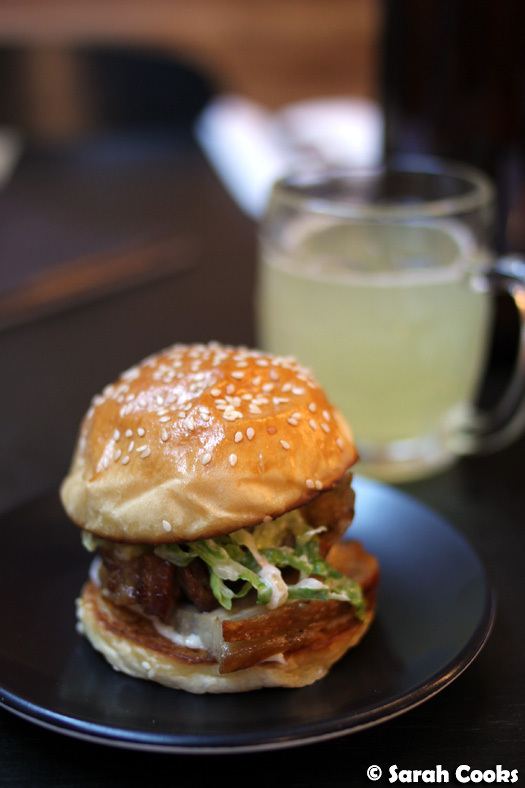 I couldn't go past the pork belly slider again, and it didn't disappoint. There was even extra pieces of crackling in there. What a treat! 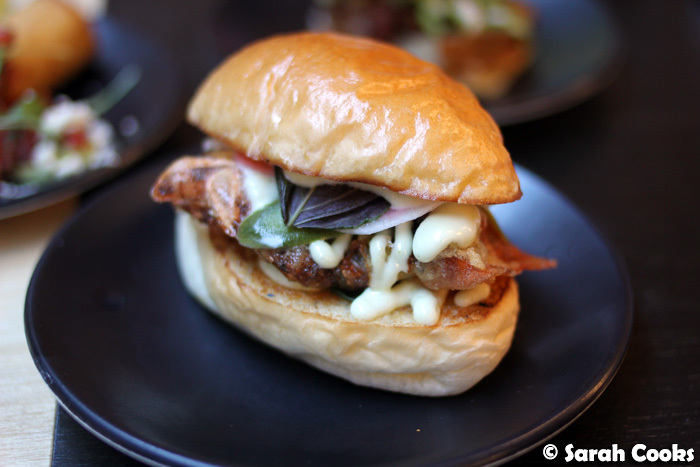 The soft-shell crab slider was another winner, with a great balance of crisp (the deep-fried crab), rich (the wasabi mayo), and refreshing (pickled radish). I was a bit dubious about the charred pineapple in the taquito, but I couldn't resist the lure of pulled pork. 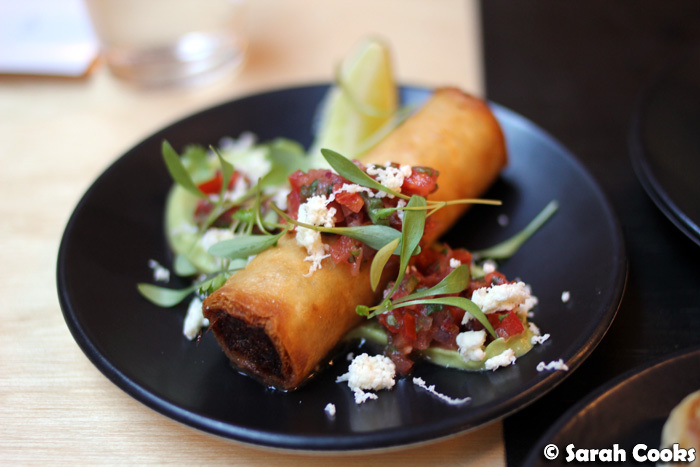 I really loved this dish - the crisp and rich taquito contrasted beautifully against the limey tomato salsa and refreshing pineapple pieces. I was also amazed by how finely diced the tomato salsa was - I make pico de gallo at home quite often, and I can never chop it that fine. Have to work on my knife skills! No such complaints though, with Sandra's wagyu burger. As per usual, she requested this with "no lettuce, no salad, no vegetables", and it was a pretty solid burger! 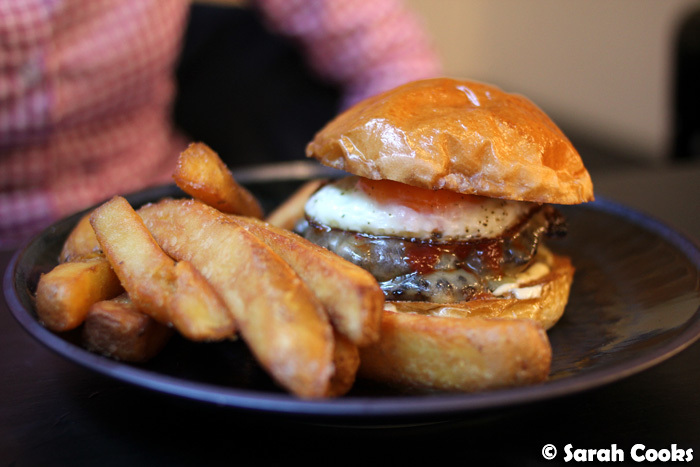 A thick and juicy wagyu beef pattie was topped with bacon, cheese and a fried egg, enclosed in a toasted fluffy white bun. The above picture may make it look small, but those were some pretty gigantic chips! Cut extremely thick, they were about the size of four regular chips in one! I loved them. Unlike the underwhelming wedge-shaped chips that came with the parma at the bloggers' dinner, these were fantastic - crisp and crunchy on the outside, with loads of fluffiness on the inside. Win! Having read some other blogs on Captain Melville, (see The Burger Adventure and Dining Nirvana), it seem that the wedge-shaped chips are usual - I really hope they keep these rectangular chips instead, because they were seriously awesome. The presentation of the chocolate mousse was similar to the banana split - two quenelles of chocolate mousse, irregular pieces of chocolate sponge and Anzac biscuits, garnished with shards of meringue - I tried not to steal too much of this from Wes, but had to try "for blogging purposes", you do understand. 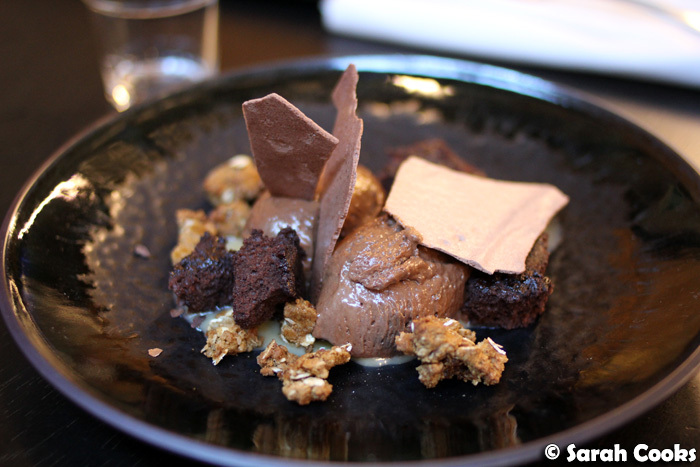 I did love the crunchy pieces of Anzac biscuit, but if I had to choose, I'd definitely go the banana split next time - it was definitely the superior dessert! It was good to see that Captain Melville was just as enjoyable on a normal, non-blog event night. The service was efficient, whilst still being relaxed and friendly. The dining area behind the bar, with its high ceilings and abundance of natural light, was a pleasant spot to while away a few hours whilst enjoying good company and good food. 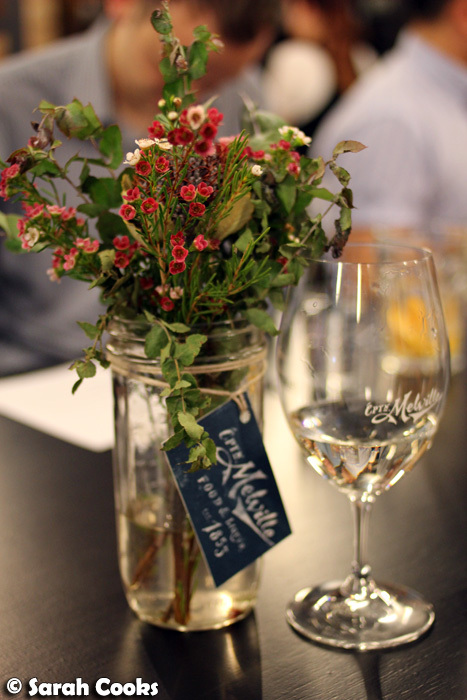 Sarah attended the Bloggers' dinner at Captain Melville as a guest, and visited on a separate occasion as a paying customer. The quinoa salad and the banana split. Stick a fork in me; I'm done. You have seriously convinced me to visit! Well done. The Quinoa Salad is my fav, and thats serious for a meat eater to say! Ahhh I don't work far from this place at all. I always see people sitting outside for post-work drinks - after reading this post, I definitely need to pop by for a meal too. Not normally a dessert person but that banana split looks awfully good. Their desserts, especially the chocolate mousse and banana split, look amazing with their toppings and add ons. These are similar to the sweets I tried from a finger food catering and I'm sure these are equally hard to resist.